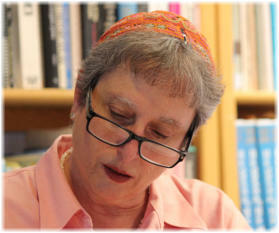 Sunday, 13 September 2015 Rabbi Deborah J. Brin We begin with a story. It is about a man named Alvin Straight. You may have seen the movie about him, called: “The Straight Story”. In 1994, Alvin Straight heard that his brother had had a stroke. Even though they were estranged, and had been estranged for a long time, he wanted to visit his brother and make amends. It wasn’t going to be as easy as one would think. Alvin no longer had a license to drive a car, because of his eyesight and limited mobility. So he got creative. He hitched up a small trailer to his John Deere riding lawn mower, which had a top speed of 5 miles per hour, and rode it from Laurens, Iowa to Mount Zion, Wisconsin – a trip of 240 miles. One evening, after making camp, he encounters a teenaged girl who had run away from home. She is obviously hungry, so he shares his dinner with her. They get to talking about her problems and she declares that she is never going home again. He tries to explain about the importance of family but his words aren’t getting him anywhere. He asks her to go get a stick. She does. He asks her to break it. She does. He asks her to get two sticks and to hold them together and then break them, too. She does. Finally, ignoring her glares, he asks her to go get three sticks, hold them together and to break them. She can’t break three sticks together. That’s when he says that we are like those sticks. It’s easy to break one or two of us, but when we are gathered together, like a family, we are much harder to break. Our synagogue community, Nahalat Shalom is a bit like these two people. Just as the teenager rejected her family and ran away from it, some of us also ran away from the organized Jewish community. We had good reasons for leaving. For those of us who grew up in the Jewish community, we may have felt alienated, stifled, or rejected. Many of us we got the message that for one reason or another we didn’t belong, we didn’t fit in. We are also like the older man in the story who knew that even with all of the difficulties being connected to other people, being a part of something larger than oneself is important for our well being. Out here in the high desert of the Southwest, the ones who started Nahalat Shalom realized that they could express their desire for community in a way that they and their families could feel comfortable and everyone could be accepted and valued for who they are. Traveling at 5 miles an hour on a riding lawn mower provides many opportunities to decide that the journey is too long or too hard or too uncomfortable. We began our journey as a synagogue community in 1982, and in those 33 years have steadfastly kept the creative juices flowing to become who and what we are today. We have created a community that is a warm, welcoming, spiritually alive, vibrant Jewish home where we learn, sing, dance, pray and make beautiful music together. We are no longer peripatetic, wandering from place to place. We have our own place that beautifully reflects who we are and the work that we have done to make it our own. I have heard the stories of how, in the year 2000, we bought the property and then proceeded to make it habitable. The minister of the church still lived in the house next door, and he suffered from a hoarding disease. After he filled up his own house, he began stashing things in the church. The rooms behind what is now our gallery were filled from floor to ceiling with shoes. Everywhere we look now, whether it is the courtyard which was asphalt and chain-link fence when we bought the place, the Sanctuary, the house next door, Bayt B’racha or the Cheder, the creativity and hard work of community members who rolled up their sleeves and made the buildings and grounds both functional and beautiful shows itself. As one small example, I invite you at your leisure to look at the baseboards in this Sanctuary. They were all hand-made by congregants under the tutelage of Hershel Weiss. Everywhere we look someone has used his or her own resources, energy, and elbow grease to make it more beautiful and more functional. Some of us gathered here tonight in this beautiful Sanctuary have been a part of the Nahalat Shalom story from the beginning. Many of us have joined the narrative much more recently, and some here this evening may not be members yet or may be here for the first time. Regardless of when each of us became a part of the Nahalat Shalom story, we are all here tonight, on the evening of Rosh HaShannah, the evening of a New Year, because this is where we want to be. You are here because you want to be here, and so am I. The Jewish experiences that we craft here are fulfilling, nourishing and transforming. Together, we are creating a Jewish life that profoundly alters what we inherited, and we are doing it for ourselves, and for those who come after us. Some of us have children and grandchildren, all of us are invested in the quality of life for future generations. L’dor vador: from generation to generation. I have now had the privilege of officiating at wedding ceremonies for the children and naming ceremonies for the grandchildren of some of the founders of our community. Our Nahalat Shalom community is a vibrant and vital link in the chain of transmission. We are simultaneously passing on our various heritages, traditions and cultures as well as adding our own visions and values to what we pass along. Rosh HaShannah is a holiday where we are encouraged to take a look at who we are as individuals — we begin to do an “accounting” of our thoughts, actions, behaviors and attitudes, and we make decisions about what we would like to change, sincerely apologize for, and fix in the coming year. Martin Buber, in Tales of the Hassidim, tells us about a Rabbi named Zusya. "Before his death, Rabbi Zusya said 'In the coming world, they will not ask me: 'Why were you not Moses?' They will ask me: 'Why were you not Zusya? '” I alluded to this idea last Rosh HaShannah in my sermon, “Music as Metaphor for Community”, where I spoke about the variety of musical instruments in an orchestra or ensemble and how we need them all to share their own voices with us. We need flutes to be flutes, trombones to be trombones and violins to be violins. Just as Zusya needed to be Zusya and not pretend to be Moses, each one of us needs to blossom into who we truly are, be the best at being ourselves that we can be and bring ourselves fully into the community sharing in services and events and offering our talents to working teams within the synagogue. These next ten days, from now until Yom Kippur, are called the 10 days of t’shuvah, the ten days of repentance. This is a time period when we examine our motives and ourselves and begin the process of turning toward what is good, positive and healthy and turning away from what is negative and destructive. Our tradition calls this “chesbon hanefesh”, an accounting of the soul. It is a time of “taking stock”, a time of inventory. We need to get as full a picture as possible from this kind of inventory. We account for the good, the positive and the healthy as well as what we need to change because it is not so good. We lay the foundation for becoming our true selves. As for individuals, so it is for communities. Zusya needed to be Zusya and Nahalat Shalom needs to be Nahalat Shalom. The way to become the best Nahalat Shalom that we can be is to take stock, take inventory. Between now and our annual meeting in November, we have some chesbon hanefesh, some soul accounting to do. You might be asking yourself, why now, what makes this Rosh HaShannah the time to begin this congregational inventory? The answer is that the process has already begun and it will be more effective if everyone is a part of it. Last spring we began working with consultants. We have unworkable and unsustainable systems. Even running a bare bones budget, we are chronically short of money. We are understaffed for the size of our institution. The Va’ad members are overburdened, as is the staff. This is not a recipe for success Our consultants posed two questions to the congregants who gathered at our open meetings last spring. The first question was: mah nishtanah halailah hazeh? It is one of the four questions we ask at the Pesach Seder. Why is this night different from all other nights? In other words, what makes this time of crisis any different from our chronic condition of crisis? Which leads us to the second question they asked: Is it time to declare that the Nahalat Shalom experiment is over? In other words, shall we consciously put Nahalat Shalom on hospice? When the shock wore off, the response was overwhelmingly affirming. We should definitely continue. One member said that Nahalat Shalom is so important to her, that if we cease to exist she would have to move. Our synagogue community is important in more ways than we can count. So the decision was made. We will survive. And that means figuring out how to create systems that will work to give us stability and sustainability over time and still keep the vital, vibrant and wonderfully unique personality of our community. We do have many congregants who contribute their skills, knowledge and expertise to our congregation. What we don’t have is a viable structure that supports and sustains their volunteer work so that they can contribute without burning out. We are in the process of envisioning and creating a viable and clear structure for new members and veteran members to volunteer, for more people to get involved and to help do the work of the congregation. Being from Minneapolis, I immediately thought: how are we going to float the boat, and what kind of a boat is it? Perhaps we are a raft, where the logs are all tied together. Our commitment to each other and to the synagogue binds us to one another like the logs in a raft. The larger our raft becomes the more stable it will be. This is not a typical image of a synagogue, and Nahalat Shalom has never been a typical synagogue. We don’t need to mimic the organizational structures of the kind of synagogues that many of us ran away from. Our organizational system needs to fit us and serve us well. Whatever it looks like, whether it is a raft or a sailboat, we must make sure that it floats and that it will take us where we want to go. We need creative, competent, committed and skilled individuals to step up, continue working on the design of the structure, and fill that structure with volunteers. The Va’ad, the Communications Committee, the Front of House committee and I have continued the work that we all started at the retreat last spring with the consultants. At that time, congregants were clear that our goals should be to learn how to cultivate our connections with one another, and to grow our financial resources so that we can support this wonderful dream that we are dreaming together. That means, in part, releasing the Va’ad from all of the crisis management that they have been doing so that they can be responsible for policies, finances, and fund raising. It also means creating a full-time rabbinic position so that the day-to-day management of the synagogue would fall to me. It means giving the Administrator enough paid hours to do the work that we rely on her to do, and it means that we need to envision, create and sustain a system for volunteers to help with the work of the synagogue. At our two-day meeting with the consultants last spring, we started to envision and create such a structure and that work continues We will be tweaking the system for a while until we know who is doing what, what the regular communications pathways are, and what the “job descriptions” of each committee really should be. We are asking for your help. During these High Holy Days there will be folks in the library who can answer questions and sign you up for a committee that fits your talents. The only way to get from where we are now to where we want to go is by keeping the vision alive and walking together until we get there. To paraphrase John F. Kennedy, ask not what your synagogue can do for you, ask what you can do for your synagogue. We have a lot of work to do between now and the Annual Meeting on November 8th. The work of Chesbon HaNefesh, for individuals or organizations, is not just the work of noticing what is negative, unhealthy or destructive. There are two more steps to the process. T’shuvah needs to be made. T’shuvah is a word that is usually translated as “repentance”. It comes from a Hebrew root that means “to turn”; to turn away from the negative and turn toward the positive. That means that in addition to noticing what isn’t working, we must stop doing the same old same old and fix it, change it and do it differently. T’shuvah is incomplete if the positive side of the balance sheet is not examined as well. You now know what we need to change, what t’shuvah we need to make. Let’s look at the positive side of the balance sheet. We really are doing something right! We are still here, we do exist, and we are a place where talented, interesting, engaged and passionate people come to “do Jewish” together. Guests who find their way here tell us that we are what we aspire to be - genuinely warm and welcoming. We are people centered and flexible. We show up for one another during times of sadness and joy and we help each other when life throws its’ unpredictable curve balls at us. We have an attitude of acceptance about who people are, whom they love, and who forms their intimacy constellations. We don’t require people to censor parts of themselves in order to cross the threshold into this Sanctuary. Some of our members have been Jewish their whole lives, some have become Jewish more recently, some love us and live with us and are Jew –ish. We offer a variety of ways to have prayer services and Jewish experiences that include elements from our members’ various Jewish backgrounds, traditions, cultures, heritages, beliefs and practices. Nahalat Shalom is a great synagogue community to be a part of and to support. You didn’t need a ticket to come into services tonight and you won’t need one for any of the other High Holy Day services. We hope that in exchange for being welcomed into our services you will be generous with your High Holy Day donations. We also hope that many of you who are guests this evening will decide to join us. Whether you are a member or a guest, you are here tonight because we are a comfortable and accessible community for you. The longing to belong is innate in us. Belonging to something bigger than ourselves, being seen and known and acknowledged is a powerful antidote to the chaos, violence and stress of the larger community in which we dwell. That longing to belong can be the beginning of an important spiritual journey. If this is where you are comfortable, then join us. Support us. Come and be a part of this exciting community and help provide us with the resources we need to continue to exist. Belong. Be a member. Journey with us as we delve deep into our traditions and grow stronger spiritually. Join us on our quest for meaning. Mr. Straight encountered a lot of challenges on his journey. His riding lawn mower had mechanical difficulties and broke down. He did get to see his brother, and just making the Herculean effort to get there made the amends possible. We will get to our destination, too. It will be an uneven journey. We may feel like we are traveling 5 mph on a riding lawn mower, and sometimes the changes we are making will move quickly like a car cruising down the highway. As the saying goes, many hands make light work. Zusya needed to be Zusya and not Moses. There is only one Nahalat Shalom in the world. In this New Year, let us become the best Nahalat Shalom that we can be. The longing to belong is innate in us. Belonging to something bigger than ourselves, being seen and known and acknowledged is a powerful antidote to the chaos, violence and stress of the larger community in which we dwell. Being from Minneapolis, I immediately thought: how are we going to float the boat, and what kind of a boat is it? Perhaps we are a raft, where the logs are all tied together. Traveling at 5 miles an hour on a riding lawn mower provides many opportunities to decide that the journey is too long or too hard or too uncomfortable.